To celebrate Earth Day, most years, we attend the Earth Day Coalition's (@EarthDay_CLE) EarthFest, and have written blog posts about our experiences at the event the past two years. Earth Day 2017 was different -- out of some very negative things happening in our country, a very positive movement to take action grew! We mean, of course, the national March for Science (@ScienceMarchDC) in Washington D.C.! The same day that it was announced that the national March for Science would be held on Earth Day, April 22, 2017, we learned to our delight that there would also be a March for Science in Cleveland (@ScienceMarchCLE)! Highly recommend you view this Volunteer Training Agenda PDF since it has ALL the details about the march and the march organizers. Impressive #ScienceMarchCLE volunteer leaders met today! April 19 - Think & Drink: Entomology! Featuring Platform Beer Co. - Cleveland Museum of Natural History (@PlatformBeers - @goCMNH). 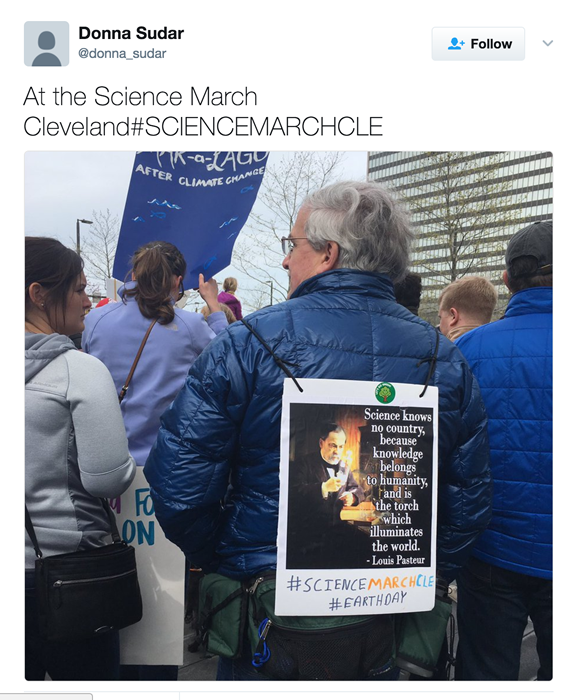 March volunteers gave out commemorative Science March Cleveland posters (download free posters here). One of the most impressive things about March for Science Cleveland was the high caliber of the partners and sponsors, who came together to support science. PowerPure LLC - Fear's Confections - Bright Green Gift Store - Barberton Printcraft - NanoSynopsis Consulting, LLC - Jakprints - People-Pet Connection - Zygote Press - InterRayBio - Praxis Fiber Workshop - Falafel Cafe - Cherub's Blanket - Filter Studio Inc.
Also, congratulations to the leaders for securing the financial support they needed. As of this writing, $5,330 of $5,100 goal has been raised on the March for Science - Cleveland GoFundMe (@gofundme) account. It is great that the our community came together to support the march. If you did not get a copy of the FREE, commemorative, March for Science Cleveland posters, you can download them here. You can also order your March for Science Cleveland t-shirts and sweatshirts online here from Teespring (@teespring). In the following two sections, we share all our 250 @sos_jr tweets and retweets which show photos and the high level of participation in these pre-march events. March For Science - The World! As we got closer to March for Science Cleveland, we started hearing about a growing number of satellite city marches. What was even more amazing was the number of cities in other countries that were hosting marches. The March for Science had become an international day to support the integrity of scientific thought. Over 610 satellite marches were planned! See the official March for Science satellite location map here. (click on blue dots) . April 22, 2017 -- Earth Day 2017 -- The BIG Day! The night before the big day, Stuart felt nervous, which is very unusual for him. We attend many events throughout the year, but to us the March for Science Cleveland was different. It represented something more important, since it was not just a mere activity, but instead represented a positive force to push against the anti-science and anti-truth direction in which our country leadership is taking us. The March for Science Cleveland organizers anticipated about 3,000 people participating in the march. We were excited at the prospect of a large crowd, but we were concerned that others might not join us in supporting something we believed in so strongly. 3,000 - Yes to ≈10,000!!!! Say no to our irrational fears of others not caring, and yes to ≈10,000 marchers! The good people of Northeast Ohio came out in force! Congratulations to the March for Science Cleveland for this grand success! After the march, the March for Science Cleveland leadership team arranged for volunteers to pick up trash, thus leaving Cleveland Public Square (@CLEPublicSquare) cleaner than we found it. Stuart, as a former Boy Scout professional and adult leader (@BoyScouts), appreciated this, since we always told the Scouts to "Leave No Trace" as part of the Outdoor Code. We met Matt Mishak (@ShakDaddie) who is co-founder of Dronewerx.com (@Dronewerx). He was filming the march from above with his drone. Be sure to click to see our photos and videos from the March for Science Cleveland in full screen mode! The photos will show the creativity of the march attendees' signs. To get a real sense of the day, please scroll down through our @sos_jr tweets and retweets two sections relating to March for Science Cleveland. Please share any photos and videos that you find interesting by retweeting. Even though the march is over, it is important to continue to share the message with others and to thank the participants for continuing to take action. After the March for Science Cleveland, we attended the Earth Day Coalition's (@EarthDay_CLE) EarthFest. Each of the representatives we talked to had a great Earth Day or outdoor-related story that would each warrant a full blog post. We will instead let our 40 @sos_jr tweets and retweets from the event tell the story. We also want to thank the Earth Day Coalition's sponsors -- we think their support of "Ohio's largest environmental education event and the longest running Earth Day celebration in the nation" is important! We marched! Now, we act! The April 22, 2017, March for Science Cleveland (@ScienceMarchCLE) and the national March for Science (@ScienceMarchDC) are only the beginning! There is a need for everyone who cares to do more in the coming months. In our blog post, we always like to list other blog posts and articles about the events we attend. The challenge for the national March for Science and the March for Science Cleveland is that the events were so large that it would take us too long to properly cite all the sources of the articles. Here are links to some of the articles we saw (most of these are mentioned in the above tweets) -- if you look at the website address, you can see the source and the subject.